The plot was so incredibly thin, you could see right through it. I know this is a classic shoot ‘em up action movie, but at some twist or surprise could have been added. Sure Alex Murphy is rebellious against his automated restraints, and they did try to play at this, but it was poorly executed and did not work for me at all. Another thing is Joel Kinnaman’s performance. To me he is not convincing as neither Alex Murphy or RoboCop. Gary Oldman and Michael Keaton on the other hand both did a brilliant performance - as always. All the action sequences are nicely done, and the CGI with Alex Murphy’s body transformed into a cyborg is also fairly well done. The RoboCop outfit on the other hand seemed a bit lame to me though. He reminded of a medieval knight in an ill fitted suit of armour looking for his horse. Despite my rant above this is actually a pretty decent action movie and if you liked the original RoboCop movie this is a must see movie. Just do not expect to be blown away. Dead our alive you are coming with me. Remakes seen to be the biggest trend in Hollowood at the moment. This time, there is a new version of Paul Verhoeven’s RocoCop (1987). The movie takes place in 2028. 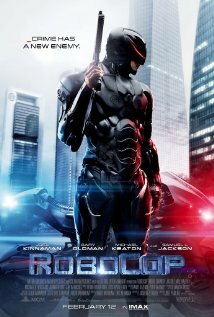 In the original, detective Alex Murphy was nearly killed and quickly reborn as the RoboCop (part machine, part man). This time, the creation of the RocoCop takes more time (RocoCop is created and tested in China). Alex Murphy’s family also gets more screen time (we barely saw the family in the original). We also get some conversations about the difference between humans and robots (good for character development). The cast is strong. Michael Keaton, Gary Oldman and Samuel L. Jackson are all doing well. Joel Kinnaman does an acceptable job as the new weapon against crime (I still think Peter Weller was better as the original RoboCop). Antoine Vallon/Patrick Garrow is the guy responsible for the “death” of Alex Murhpy, but is actually a weak villain (Clarence Boddicker/Kurtwood Smith was much more frightening in the original version from 1987). The special effects are good. The new dark RoboCop suit looks cool. Thanks to CGI, RoboCop is now able to run (the original RoboCop suits looks a bit clumsy today). ED 209 is back and seems bigger and deadlier than ever before. The combination of robotic parts and human flesh looks believable (also thanks to CGI). This version lacks the satiric edge of the original RoboCop. The original RoboCop was ultraviolent, but was somehow still funny (a modern satire about man vs. machine). The 2014 version is not as violent because of the PG13 rating. The ending is OK, but also a bit tame. This is a decent remake, but not as good as Paul Verhoeven’s original movie.